A non-profit for Prospect Development professionals. You Should Write a Blog About That! As part of our goal to share industry and career-related information to colleagues in the fundraising development field, we encourage you to contact us if you would like to contribute to our blog. We also enjoy reading other blogs and may contact you to share a guest post. The working relationship between researchers and gift officers can make or break a shop’s morale, efficiency, and ability to reach its goals! Wouldn’t it be awesome to be able to match yourself with major gift officers based on strengths and working style capability instead of random assignments? In this month of love, APRA-IL is having some fun and imagining a world where we could pick our perfect research and gift officer match. In an ode to all the popular reality match making shows, we present to you- a new series, Match Makers: The Prospect Development Edition. Host: And we are back everyone! Welcome to another episode of Match Makers: The Prospect Development Edition. Let’s also welcome back our researchers Xavier, Veronica and Melissa, and our major gift officer Jared. I hope you all are ready for today’s challenge because it will be enticing. Jared has very important information about a prospect’s mother. The prospect: Gabrielle Hunter is now assumed to inherit a significant amount of wealth, in addition to her current career and status. It is up to the researchers to verify this information, and report their findings to Jared. Will our researchers uncover the truth about this mysterious inheritance? Or will there be more to learn about this family? Stay tuned folks, this is going to get interesting. Host: Let’s hear from our researchers and find out what they’ve found. Xavier: So, I spoke with Jared this morning and learned that Gabrielle Hunter’s mother supposedly owned several properties in her home state of Illinois, and several farms in Iowa, where she lived with her husband for some years. The Hunters are an interesting family and have always been rumored to be an affluent family, with a name tied to wealth thanks to several Hunters being very successful in rural real estate, in the late 60s. I began to search for the Hunter name in Illinois, and thanks to Jared, I also was familiar with the towns in which their properties were located so I knew resources to use to access property records related to ownership and taxes. After searching for an hour, I found nothing beyond property values of these rural properties to help inform me of their wealth beyond real estate. I was able to find a few properties but only one or two were being held by the family. Being able to confirm that the family holds at least one of these homes does give me some idea of their capacity but the lack of clarity on their ownership of the other properties makes it hard to give a complete assessment of their holdings. Based on the difficulty of my search, I can confirm that this family has taken great steps to shield their wealth using LLC’s and other strategies. I found an old interview with the Chicago Tribune in which Gabrielle Hunter’s father describes an interest in being an angel investor to several real estate companies in the country, and would not reveal the ones he was in talks with. While this explains the hard to find personal information, it still gives us something to work with since he has disclosed that he has enough capital to be an angel investor. I brought this information to Jared and explained the significance of an angel investor- someone described to be an investor to small start-ups, and entrepreneurs, and to meet the Securities Exchange Commission's (SEC) standards, an angel investor is one who must have a minimum net worth of $1 million and an annual income of $200,000. And based on the Hunters’ anonymity, as a researcher I could only conclude that their wealth has been based on the residuals from these investments. Host: This is amazing, I was not expecting this! Melissa, what were you able to find? Melissa: I could not find any signs of property under the Hunter name, and search tools such as Lexis Nexis, only gave me old addresses. But what I did find was a large gift made to a hospital in Illinois under our prospect’s mother’s nickname. Although we already know her nickname is Shelly, I still had to verify that it was really her because she was acknowledged as simply “our most devoted volunteer Shelly”. Michelle Hunter, Gabrielle’s mother, is known to speak highly of this hospital in public settings and her previous gift officer has noted her volunteering experience. I think this information should be a great indicator of the Hunter family’s capacity, and perhaps what Gabrielle could inherit from her parents, being the only child. Host: Great work Melissa, I would like to remind our audience- It’s important to emphasis that your fundraisers are keeping their interactions with prospects in the database up to date, and recording all the details. A good contact report can sometimes be the only trace of a previous relationship or strategy and could make or break future solicitations. It truly helps the researchers. So, shout out to that previous gift officer who entered their contacts! Veronica: After getting all the information about the prospect’s potential inheritance, I started searching for the properties and farms, and came up with not much to work with. I unfortunately spent hours using all the resources available to us, and still found very little. I did find that although Gabrielle’s mother didn’t own properties, Gabrielle has two a summer homes in Florida and recently bought a condominium in New York. Thanks to some interactions with her previous gift officer I verified her comments on wanting to own homes in those states as factual. I think Gabrielle has major gift capacity, and although we hear things about her family, she is building her own reputation! Host: Wow, I’m sure Jared appreciates learning this news about Gabrielle, thank you Veronica! Jared, its time now, the audience and I are dying to know what you thought about the researcher’s feedback and who won this challenge? Jared: Well honestly, I am shocked at what they uncovered. Each one of them gave me so much to work with and I will be setting up a meeting with Gabrielle to talk about a gift, using all the information learned today. Today, I will not be crowning one person the winner because they all did an exceptional job with the information I gave them. I think they made sure they brought something I could use and add to my strategy and I am grateful. Thank you researchers! Host: *In shock* Folks I think Jared just changed the show on us. This was not planned! Are you saying we don’t have a winner today Jared? Jared: Nope, I’m sorry they all won this one! Host: Well there you have it folks! Today everyone is a winner. Thank you all for joining us for another amazing episode! This challenge was full of twists and turns! Make sure to join us next time on Match Makers: The Prospect Development Edition. At the end, there will only be one match. I know that there are a lot of resources for prospect development professionals through social media out there but I’m not sure what to do with it all. Are there better social media sources than others? How do I decide what platform is best for my research purposes? Should I be using any information I find on Facebook or LinkedIn? Is it ethical to be using these platforms? Is it reliable? I’m wary of the potential effectiveness and ethical implications of using social media research sources but also have researcher’s FOMO (fear of missing out) by not utilizing these tools. You are right. There is so much information out there that it is hard to know what to do with it all. You are asking the right questions about ethics and reliability. There’s no one size fits all when it comes to the use of social media in research. Platforms such as Facebook and LinkedIn in particular present specific ethical challenges for prospect researchers. You might first decide what social media sites you want to use. For instance, LinkedIn seems to be a fairly standard social media site used by fundraisers and prospect researchers alike. The purpose of the site is professional with job information, etc. Gift officers may even use it as a tool to supplement their regional visits. Facebook may be trickier since it contains much more personal information, beyond the job. Twitter even more so. With whatever sites you choose to use, you should probably take the information with a grain of salt. Everything is self-reported and may not always be up-to-date. But then again, anything a prospect says to a gift officer or staff member is also self-reported so don’t shy away just because of that. I like to look for clues about the person by looking at their LinkedIn profile. I like to consider how much information is available? Do they list one job and that’s it? Or does it seem they are updating it constantly? That can provide some clues as to the reliability and potential usefulness of the information. That’s a first step. Second step is try to verify the information to the best of your ability. For example, if they work for the XYZ Company, it may be worth going to the company’s website and seeing if they are there. Some companies will have lots of information about their employees and some don’t. You can also look up companies and see if there is information about them to ensure they exist. You can see what’s in your database about the person and see if it matches. Basic attempts at verification like these can greatly enhance your confidence in using these types of social media resources and doesn’t stray too far from traditional prospect research work. In terms of ethics, APRA International has provided guidelines about the use of LinkedIn that can be found here: http://www.aprahome.org/d/do/4884. One point that they are explicit about in this discussion is that it’s okay to look at a person’s profile even if you are signed in. You can even do it anonymously by adjusting your privacy setting. However, you cannot create a fake account or misrepresent yourself. That would be considered unethical. Special note: There’s a lot of furor in the UK about data and prospect research. You can read a little bit about it here http://apraillinois.org/blog/5016608. If you are conducting international research it is important to remember to tread carefully and consider local laws in regards to privacy and data use. Ultimately, you may want to work with folks in your organization to put together a policy statement about how the information is going to be used. That way, everyone adheres to the same set of rules. Hope that helps you manage the amount of social media out there and make use of it for your work! Good luck! This is the saddest week of the year. It’s a little over a week since APRA International ended. It’s the longest period until the next one! As you may tell, APRA International remains one of my favorite times of the year. There’s nothing like a few days to talk and learn from your colleagues from all over the world and different institutions. Plus, this was the 30th annual APRA International. One of the sessions that I attended “Organizational Capacity Ratings: Don’t Leave Them out of Your Campaign Mix Tape”. Four institutions presented their different methods for handling organizational data including University of British Columbia, University of Alberta, University of Washington, and University of California – San Diego. Each institution reviewed how they rated organizations. I thought that University of Alberta’s system was the most impressive. Instead of developing one system to rate both corporations and foundations, they have developed two different systems for each. In their system, they use three criteria for rating corporations, creating a matrix to rate corporations on operating revenue, affinity, and fit. The system for rating foundations has four criteria including capacity, assets, affinity and fit. This is such a great idea! It never occurred to me to have different systems but it does make a lot of sense. I also attended a very useful presentation, “Grateful Patient 2.0: Integrating Patient data into Distinct Prospect Pools” from the University of California San Diego. They talked about how they turned their direct mail grateful patient system into physician based fundraising with a major gift focus in two years. That’s pretty incredible! The majority of their presentation dealt with how they got a daily patient feed of in-patient and out-patient data from the hospital each night and the administrative work that went in to it. That feed needed to be HIPAA compliant so it was critical to have good relationships with Compliance Officers to earn their trust and get the right data consistently. Their end result was a problem that every shop hopes for- a huge number of new constituents. My last session was “You Spin Me Right Round: Fundraising Regulation & GDPR Changes in the UK.” This session talked about the current and future privacy laws and their impact on fundraising. The General Data Protection Regulation (GDPR) will make the privacy laws stricter and will be implemented on May 25, 2018. It is critical to note that organizations need to be compliant when the law goes into effect so the time to plan is now. This law will “enhance data subject rights, increase fines, international reach, and stricter consent requirements.” People need to be informed of their rights about their data in a clear way. People must opt-in, instead of opting-out like here in the States. Further clarification will be released in the upcoming months and even at the beginning of 2018. The above are just a few nuggets that I learned at this year’s APRA International. I met wonderful people, learned a lot of great things. I can’t wait for next year’s conference! What makes Prospect Development a great career? APRA-IL is asking local and national industry leaders what the field means to them and why and how they have pursued success in Prospect Development. Through this blog series we will explore what drives industry leaders to propel their careers and Prospect Development forward. For this month's piece, Joan Ogwumike, APRA-IL member and volunteer, interviews Jo Theodosopoulos, Manager of Prospect Development at The Minneapolis Foundation. Jo Theodosopoulos is the Manager of Prospect Development at The Minneapolis Foundation. She launched the organization’s first prospect research program in May 2014, after successfully doing the same at Sanford Health Foundation/Edith Sanford Breast Cancer Foundation (Sioux Falls, SD) in 2012. She works across the organization with all departments to find and help build potential relationships. Jo was elected to the board of APRA-Minnesota in January 2016. Prior to joining the prospect development field, Jo spent five years in development and donor relations at the Sioux Falls Area Community Foundation. She holds a Master’s degree in Library and Information Science from the University of Wisconsin-Milwaukee and a Bachelor’s degree in Liberal Studies from South Dakota State University. She lives in Minneapolis with her husband and Wyatt the Rottweiler. Apra-IL: What impact does your work, and the overall field of Prospect Development have? And could you describe who you believe your audience is? Jo: Community foundations work to improve the lives of people in a geographic area. They bring together resources to support nonprofits in their communities. So, in a sense, my work impacts a lot of nonprofits and, therefore, the overall community by helping to find and build those resources and partnerships that support the good work that frontline organizations do. I think the same can be said for the overall field of Prospect Development. We’re all trying to help improve our organizations and communities in some form. I believe that my audience is pretty broad. I work with our Philanthropic Advisors, our executive team, our Impact Directors, and other members of the nonprofit community to further our impact. Apra-IL: As a leader, can you tell us what motivates you in your current field? And perhaps whether your motivations have ever changed? Jo: I’m motivated by the fact that our work at The Minneapolis Foundation helps support so many organizations that work to improve our community. I love working with our staff to strategize the best and most efficient way to make this happen. I also love collaborating with others across the Prospect Development field to share ideas and best practices. We’ve developed a great community among Prospect Development professionals. I definitely think my motivations have changed. I never realized before that I could be a leader, but now I’m happy to take on that challenge. Apra-IL: With 3 words, describe the role of a Prospect Development professional, and why? Jo: Strategy. I think that one of the most important jobs we have is to help inform the strategy of the organization in regard to fundraising and, in my case, grantmaking and partnerships using the data we provide. Information. Sometimes I like to use the word “information” rather than “data”. It seems a little less daunting, but that’s my opinion. At any rate, we provide the data/information used to inform strategy (see above!). Partnerships. Whether they are internal partnerships with other staff members or external partnerships with other prospect development professionals, our networks, grantmakers, donors, etc., we should strive to make those partnerships as strong as possible. Do you know a leader you want us to profile? Let us know! Apra-IL is California Dreaming... See You in Anaheim! One of our favorite times of year is almost upon us! Apra International is only a few weeks away. Many of us from Apra-IL are heading off to Anaheim, CA to learn, socialize, and even present. 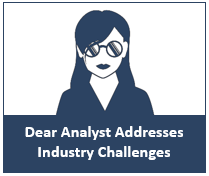 We are excited to announce that blog feature, Dear Analyst, will have its very own panel! Come with questions for our panelists, Katie Ingrao, Rush University Medical Center, Elisa Shoenberger, Grenzebach Glier and Associates, and Jessica Szadziewicz, Loyola University Chicago to answer! We have noted the sessions of other folks from Illinois below. Come and support your colleagues! For this month's piece, Joan Ogwumike, APRA-IL member and volunteer, interviews Sabrina Latham, Director of Prospect Management and Research at the University of Alabama at Birmingham. Sabrina Latham has been employed at the University of Alabama at Birmingham (UAB) for more than 25 years and is currently the Director of Prospect Management and Research - a position she has held since October 2012. She is a member of Apra International and most recently served as a member of the planning committee for ARC 2017 Conference in Atlanta. Sabrina is also president of the Apra MidSouth chapter that represents Alabama, Kentucky, Mississippi and Tennessee. She has one daughter, Anissa Simone, who graduates from UAB this month. APRA-IL: Describe your motivations to build your career in Prospect Development, and what keeps you engaged. Sabrina: It is so easy to burn out from doing the same job repeatedly. However, one comment I heard recently put things into perspective for me. Schoolchildren today are going to be working in careers that have not been created yet. I had to stop and really think about that in comparison to prospect research’s evolution to prospect development. Looking back to the eight or nine years that I’ve worked in the field there have been substantial changes in the various techniques and tools that were not available several years ago. I guess you can say that really keeps me engaged and excited about coming to work. Also, the outstanding work my colleagues from near and far are doing to promote our profession via the various professional development offerings and through Apra’s Connections newsletter motivate me to do better every day. I don’t know what I would do without their contributions. APRA-IL: Describe your journey into your current position. Sabrina: My journey started sometime in 2000 when I was working as web communications specialist in the vice president and dean’s office of our medical school. The senior associate dean and I had a long discussion about what it would take to move up in the rankings of the National Institutes of Health (NIH) federal funding. You can say we were a couple of nerds excited about all of the information that we able to find on our peer institutions as we traded random, yet interesting, statistics back and forth. Additional faculty and staff joined in on the fact finding and the project eventually grew into a school-wide strategic plan that drew over 150 team members, affectionately known as N.E.R.D.s (Network for the Evaluation of Research Data). During this time, I was also writer and editor for the dean’s faculty newsletter, inforMED. A few years later, a position on the school’s annual giving team opened up and the associate dean recommended me since I had a knack for persuasive writing. That opportunity led to philanthropic grant writing and ultimately my present role in prospect research and management. It wasn’t your typical foray into the field, but it really helped me develop the persistence for finding and analyzing information that is needed for this type of position. APRA-IL: Can you share three takeaways from your time as an APRA chapter leader? Sabrina: Never be afraid to ask for guidance from your colleagues that are serving in similar roles because starting out can be a bit intimidating and overwhelming. Everyone is willing to provide advice. When I first started, I reached out to leaders as far as Colorado and picked up wonderful tips with every call or e-mail. Collaborate, collaborate and collaborate again as much as possible. Just because you volunteer with one chapter does not mean that another chapter is off limits. At the last leadership summit Katie Ingrao (Apra-IL), Jo Theodosopoulos (Apra-MN) and I discussed merging our webinar calendars. Instead of one chapter hosting multiple webinars in a year, Apra-IL will host one and make it available to Apra-MN and Apra-MS members and so on each quarter. More details on the webinars are forthcoming. I’ve really been struggling with my portfolio review meetings with my gift officers. In particular their tendency to “hoard” prospects in portfolios when there are no planned activities or strategy to move them. My job is to assist them in controlling the number and quality of prospects in their portfolio but the more months and meetings that pass they continue to hesitate when I make suggestions for removal. Is there any way that I can communicate with them better that it’s ok to “let go”? I feel your pain and you’re definitely not alone in this struggle. We as prospect management professionals are placed in a tough position when meeting with our gift officers to help them make educated decisions about prospect movement. We can be both the angel and the devil on their shoulders in these meetings but it’s important that you have established a shared understanding of what a “healthy” portfolio means in your office for effective change to happen. In addition, your organization should have set policies on how to maintain an ideal portfolio to help prospect management execute clear consequences for any portfolio that is not being maintained. If your office has not done this ground work you have nothing to support your cause to reach a common goal of managing optimal portfolios. Shops that are starting to implement such standards usually start with basic goals of agreeing on an ideal portfolio size, amount of time allowed to attempt to qualify, and reinforcing a capacity rating minimum for portfolio additions. It’s key to include leadership in these discussions. They will most likely be charged with addressing noncompliance of said standards and so their feedback on changes will determine the ultimate success of enforcement. Not all shops will prioritize the standards that I have suggested but with whatever your shop decides, you must also be prepared to track your data. I’m assuming that your frustration is caused by seeing no change over and over in meetings; your shop is already tracking some prospect data that enables you to notice this lack of movement. You’ll need to review these reports and determine if they help illustrate whether or not a portfolio is meeting your current standards and then identify any potential standards you’d like to implement. Ensuring that you are tracking your data and creating meaningful reports will go a long way in identifying areas that portfolios need to improve. While addressing the way you track your prospect data currently, you should also consider how to put tracking policies into place that will help alleviate some of the anxiety of your gift officers about moving prospects out of their portfolios. The main fear, I believe, of gift officers is that they will be unaware of a future event with the prospect after they are removed from their portfolio i.e. gift, significant contact, or cultivation opportunity. We can’t completely alleviate all their fears but we can take actionable steps to create what I like to call “safety nets”. Examples of these safety nets would be segment coding with your database for stewardship and or annual appeal activity, an ear marking system with your database to track clear chain of command when it comes to communicating with a donor, and a regular review of recent transactions by the research or management teams to identify donors who should be managed in a portfolio. I pitch these safety nets to gift officers as reassurances about systems put into place for their benefit so that they can trust to let prospects go and keep their portfolios uncluttered. Finding the right number and variety of safety nets rests with each office and how they operate but being open and transparent on what happens to prospects once they are removed from a portfolio can build a strong sense of trust with a system for many overloaded gift officers. So you’re probably thinking, “Yea, self-analysis and overhauling policies are great steps but what should I do if they still just won’t let go?” This is probably where the majority of us live. Going 10 rounds of “Why are you holding on to a low rated prospect when I have much better options?” It’s critical at this point to know if you have the support and buy-in from the gift officer’s manager. If you’re positioned well, you only need to reiterate the shared agreement on what a “healthy” portfolio is and what the consequences are when that isn’t the case. Move forward with said consequences while always being clear that your responsibility is to the efficiency of the portfolio. If you are not in a good position or lack the support of their managers, you will need to reevaluate your office’s policies and goals. It is impossible to reinforce rules that everyone doesn’t follow and seriously jeopardizes your ability to be effective in helping gift officers reach dollar goals. I find that consistent communication of the goals and the steps that need to be taken work well in the fight against prospect hoarding. I am writing to seek you advice/recommendations on best sources of information on tracking/handling children of wealth before they themselves attain major gift capacity. We have been working towards identifying the MG prospects among the parents of incoming freshmen as early in their 4 years at our institution as we possibly can. We try to find ways to “touch” these families early and often so we can turn the parents into donors while their children are still students. Once the children graduate, most parents (although not all) redirect their philanthropy to other causes. There is nothing more frustrating to me as the lone researcher here to uncover a family with capacity during the child/student’s final semester. What a squandered opportunity! We are also trying to expose the students of these families to the meaning and impact that philanthropy (including their parents’ giving) has on the institution. Most importantly, and most germane to my original purpose in reaching out to fellow professionals, we are looking for effective ways to identify, track, and stay connected to these the students after they have graduated. We would like to closely follow these individuals through their careers so that we are on their radar screens as one of their top philanthropic causes BEFORE they acquire Major/Leadership capacity. To expose the students and families of the impact of philanthropy, you can do a few things. In their freshmen year, encourage a day of community service to some other organization, no monetary donation mentioned. This introduces the idea of giving back. DePaul did this a day before classes started, so it was easier for everyone to participate. Reach out to sophomores for a donation of $5 to the school and tell them why it matters to the university. Ask juniors for $10. Then the senior gift ($20.17, $20.18, etc.). I think this is a good introduction to giving and is manageable. Loyola also does a special day in March (it was this past Wednesday) when they go to busy buildings and have giveaways to entice students to write brief thank you notes to donors. This day is done in March since that is when tuition payments run out, donor money is needed to keep the university functional. I love this idea and the students line up to write letters (they get a stuffed wolf and kettle corn). I worked at two colleges that kept pretty strong FERPA boundaries, which meant we didn’t have access to student records. Both tried parent giving clubs. We often knew when alumni and non-alumni donors were sending their kids, so we’d mark the parents’ records accordingly, and then cross-reference the kids and the parents as soon as the kids became alumni and were added to our databases. Parent giving clubs were modestly successful – anecdotally, I’d guess they had better success if the kids were active in athletics or performing arts or some such – if there was a reason for parents to visit and be proud of their kid, that kept them giving throughout the four years and perhaps beyond; otherwise, it was often one-and-done or two-and-through. This is a unique group for your pipeline and it’s important to maintain your list within your database and not a separate spreadsheet. Give this group a code or flag to track in the database for reports. Plus, a special indicator on their record will remind anyone coming across their name they may not look like a prospect now, but there’s future potential. Have one person in the research or prospect management department take ownership and maintain this group. That person can set up news alerts and add the names into periodic screening batches. This ensures one person is always keeping them on the radar when there’s inevitable turnover. The ideal scenario is to outright rate and assign them to a major or annual gift officer’s portfolio with the relationship now focused on them and not their parents. Unfortunately, metrics will be a common reason given as to why they’re not contacting them annually or dropping them from portfolios. This group of alums is likely not going to meet major giving thresholds or be immediate dollars raised for annual goals. This is another good case to create a metric for cultivation and pipeline building. Host: Welcome back everyone to Match Makers: The Prospect Development Edition. We are so happy to be back with our competitors at Ordinary University! Let’s reintroduce our researchers- Xavier, Veronica, and Melissa, and our major gift officer is Jared. Welcome back guys, I hope you’re all ready for our first challenge. Audience, our first challenge is called “Building Blocks- Can you build a portfolio?” The objective is for our researchers to compile prospects for Jared’s new portfolio which would aid OU’s School of Nursing. A portfolio must consist of top major gift prospects the researchers believe Jared would want to meet. To make things a little more interesting, the researchers have one week to put this together- 60 total prospects, so it is a very small portfolio, and 30 must be found through proactive research- we are trying to expand the Nursing School’s prospect pool. Once the portfolios are in, Jared will decide who the winner of this challenge is. Great! May the force of Lexis Nexis be with you all! And we are back with our researchers and major gift officer. Let’s take some time now to get to know our researchers and how their week has been. Xavier: Hello my name is Xavier, I’m originally from Virginia and I’ve been a researcher at OU for one year and have been in the research profession a total of 2 years. I’ve worked in other small shops before besides OU so I have some experience fulfilling research requests for portfolios of this size. I feel like this was a good challenge for me, because I think as a researcher my strengths lie in my tenacity to find necessary information. But I still feel overwhelmed at times due to the amount of information one can find about a prospect. I mean, let’s be honest, these are very high capacity givers- their careers didn’t start yesterday, so putting together the portfolio was not the easiest under this kind of pressure. It felt like I was picking long needles out of a haystack. Looking at my portfolio, it’s strong- I made a list of the best 30 proactive and 30 reactive prospect’s names, and included their companies and giving capacity. Host: Wow Xavier, I feel the pressure just hearing your feedback. Let’s hear from Veronica. Veronica: Hello my name is Veronica, I’m originally from Texas and I’ve been a researcher at OU for 3 years and started as a Development assistant. I enjoyed this research request despite the pressure, and I felt like there were too many options when it came to searching for the 30 proactive prospects, so that took majority of my time to gather the 60 total. I decided to include a map of my prospects as a visual aid for Jared’s travel plans. I then listed the prospects based on funding priority, and added a very small blurb for each of them. For me, choosing priority was based on the prospect’s philanthropic behavior, and career history. Host: Impressive Veronica! Next, let’s meet Melissa. Melissa: Hello, I’m Melissa and I am an OU alumna and small town native. My career started in the finance department and somehow, I maneuvered my way into prospect research, and have been here for 3 months. I feel like my portfolio is strong because I gave Jared the ammunition he truly needed- along with my 60 prospects I gave short blurbs on each prospect and focused on capacity ratings. I believe the time span allotted for this challenge was THE challenge- I think with a portfolio of this size you still need a lot more time, so I am grateful for the days and evenings we were given to work on it. Host: Well, thanks everyone for participating! Sounds like Jared has a hard decision to make. So what do you think Jared? Jared: All three portfolios were great and honestly made this decision difficult. There were similarities across the board, but I must say that one stood out to me and that was Veronica’s. Veronica, you won this challenge mainly because you included a document flagging an order of priority. Which you stated would help me in setting up my meetings and travel plans. You also included a document that geographically mapped out the prospects in this portfolio. I really feel like these add-ons made your portfolio stand out and were just more helpful. Host: What?! Whoa Veronica, you really grabbed the bull by the horns for this challenge! Now let me say, we never made restrictions on what could NOT be in the portfolios- Just so we’re all clear on the rules. Jared: Exactly. So, Veronica wins based on the bonus features which I found extremely helpful. Xavier’s portfolio was good because his prospects worked at notable companies and hospitals, and held interesting titles. But he didn’t give me much else to work with. And Melissa’s portfolio was impressive, but with the capacity ratings and no additional information, I lacked conversation pieces. It’s important that I connect with these prospects on an organic level. Host: Well folks I think we’ve all learned a great lesson here: make sure your portfolio is original, helpful, and presents an array of information that can help your officer with the conversation and of course his ask. So now that we have completed our first challenge, Veronica is leading and has set the bar high. I want our competitors to know that these challenges are only going to get harder. Remember to push yourselves and think creatively with your presentation and relevant material. Join us next time on Match Makers: The Prospect Development Edition. At the end there will only be one match. As a prospect researcher, I am proud to perform due diligence, uphold data confidentiality, and bring a holistic viewpoint to fundraising strategy. I try hard to perform research in a way that balances my organization’s needs and mission with the needs and wishes of our supporters and I am proud to be part of a research community that supports these goals. I am a proud Apra-IL member because we are a welcoming, engaging, and innovative community that is driven to further the missions of amazing institutions and to better our world. My job as a researcher is fulfilling because I get to specialize in a certain skill in order to advance an organization I care about. It feels good to an important contributing member of team that can really make a difference. Additionally, I appreciate that working at a small shop allows me to juggle a lot of different duties, from capacity ratings to prospecting to industry analysis to board nominations. I am proud to be a researcher because over the years I have learned the worth of a researcher, not just in fundraising efforts but for overall productivity. We hold so much power and creativity as we search, analyze and master the functionality of research in our respective positions. So I say with pride- Always keep the search going for whatever your purpose is. As the senior research specialist for Rotary, I’ve been called a golden retriever, a stealth reference librarian, and a rock star. However, when people ask me what I do, I usually say I’m a treasure hunter. I point my front-line fundraising co-workers toward those who are most ready, willing, and able to support my organization's programs. It gives me immense joy to be able to use my skills to help organizations advance their mission. Funding is important for every nonprofit so they can go out and do the amazing work that they do. I love that I have this skill set that can make the difference for organizations. Apra-IL is a 501(c)6 non-profit organization. Copyright © 2019 Apra-IL. All rights reserved.